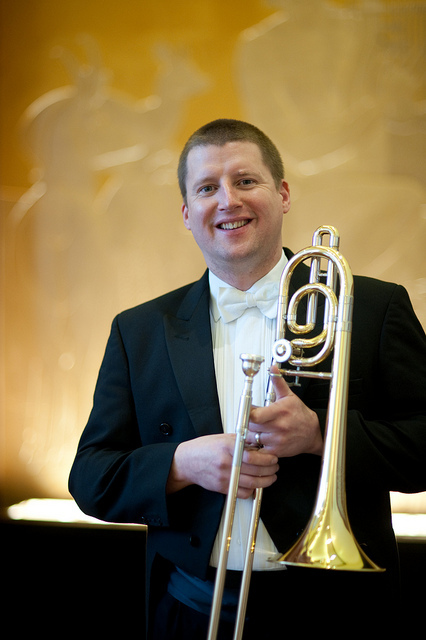 The world’s oldest, continuously playing brass band, Besses o’ th’ Barn Band of Whitefield, North Manchester has appointed Simon Cowen, aged 42, Principal Trombonist of the Royal Liverpool Philharmonic Orchestra, as its new Musical Director. The appointment takes effect immediately. As a trombonist, Simon has played with all the major UK symphony orchestras including the City of Birmingham Symphony, the Academy of St. Martin in the Fields and the London Symphony Orchestra. He has performed under the baton of such famous conductors as the late Sir Charles Groves, Sir Simon Rattle and the late Carlo Maria Giulini. Simon was also principal trombone with Black Dyke, Fairey’s and YBS brass bands for many years. In 2012, he performed a concerto for two trombones alongside the trombone virtuoso Christian Lindberg with the Royal Liverpool Philharmonic Orchestra, with whom he is now principal trombonist. Simon has also played on many film and TV soundtracks and performed with acclaimed pop bands such as Elbow and Beautiful South. The Band has launched a new recruitment campaign under the additional title “World famous Lancashire brass.” Both young and experienced brass and percussion players are welcome to audition. For further details call Dr Yaakov Wise on 0161 720 9588 or email yaakovwise@aol.com.